Q&A: Retired couple: Help crossing the street! Question: My husband and I are a retired couple who frequent Phuket, and usually have no complaints, but have just about had it with the Sam Kong neighbourhood, and are ready to move from our current base here, as it seems we can no longer safely get to the Tesco Lotus anymore due to the underpass construction. We stay in Phuket for months at a time, and had been staying on Soi Tida, near the Esso Service Station off the Bypass Rd, as it used to be quite convenient. Everyday we used to walk to Sam Kong, visiting restaurants there and of course, go shopping at the Tesco Lotus. It used to be okay for us to cross at the traffic lights, but ever since they started digging that trench, it's been a life gamble, escaping death just to get across the street. We've found one area to cross near the cabaret show, as we followed large groups of Korean and Chinese tourists who were brave to make the run for it, and go through the construction barriers. One time, my husband almost slipped off one of the planks into the mud. It was startling for us. Sometimes, we wait for 20 to 30 minutes for an opening to safely run across the street. Can you find out if they ever plan to build a pedestrian bridge or standard crossing in the future, or if we should just pack up and find a new neighbourhood to stay in, for good? Answer: Dear Paula and Bob, thank you for your inquiry. We were wondering the same thing, as our office is located right at the junction, in Billion Plaza. 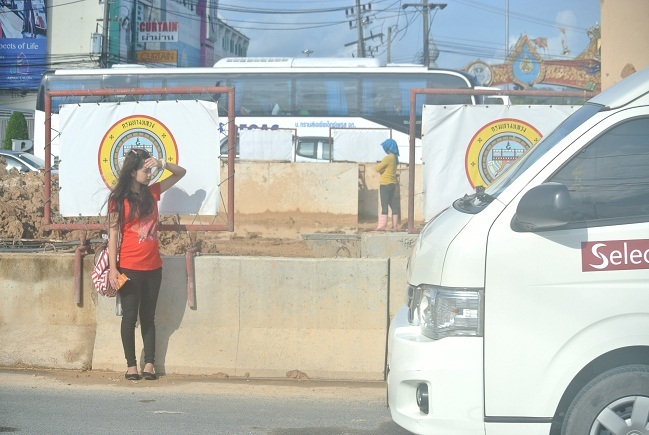 Some of our staff used to walk through the cars stopped at the traffic light to get across and have lunch at the shopping centre, but even that proved to be nerve racking at times, as we often got stuck in the middle of the road amidst ongoing construction. Now, as you pointed out, it can be death defying to make the cross at the opening near the cabaret show, and as you pointed out, a long wait when the traffic is flowing. It’s such a shame that they have not thought of pedestrians for this project. When they were promoting the project at the initial public hearings, a pedestrian bridge was mentioned, but it seems those plans were thrown out the window to cut costs. In any case, we contacted the Sam Kong Intersection Underpass’ Project Engineer, Mr Chalermpol Wongkiattikun of the Department of Highways, who confirmed this and told us that the trench digging phase of the project is expected to be completed by March 1, after which pedestrians should be able to cross at the lights as before. He said that a pedestrian bridge “was out of the question” because provisions were not included in the approved plans, but that a standard cross-walk would be implemented eventually. 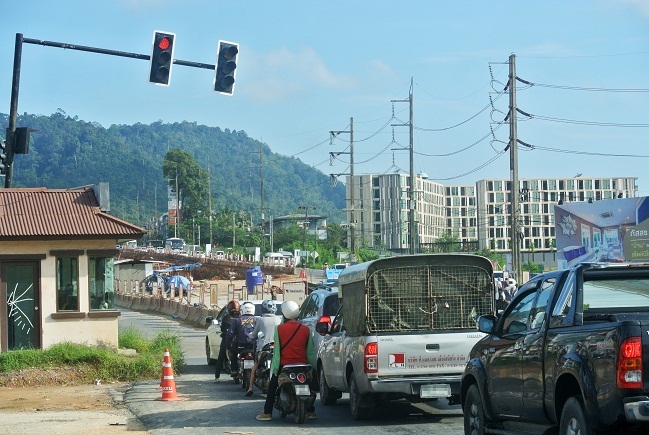 If you plan to visit/shop around Phuket, commuting by foot, we advise you to move to a more pedestrian-friendly neighbourhood which are becoming fewer every year. We can only hope that the government include pedestrians in any future development or infrastructure plans, especially if they want Phuket to maintain a reputation as an idylic destination for tourists, retirees and residents alike.